More than 40 years ago, I was asked to cover for another doctor at this unique little hospital for advanced cancer patients. Although it was just for one morning, I didn’t want to go. I saw it as a “burden.” After all, my job was to save lives, not care for the dying. Nevertheless, I went to Calvary that morning and my life was changed forever. Caring for these patients who were in the final days of their life – easing their physical, emotional, and spiritual pain – in short, providing palliative care became my life’s work. 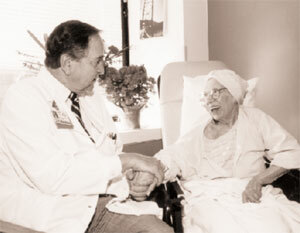 “Palliative” comes from the Latin word for coat. In ancient times, a warm comforting coat would be put around the shoulders of someone suffering from a serious illness when no other treatment or cure could be found. 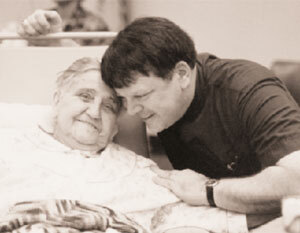 Even in today’s vastly more sophisticated medical world, providing comfort and compassion is still the most important part of caring for those who are dying. Compassion is what first motivated the remarkable and selfless group of women who started Calvary Hospital more than 100 years ago, bringing destitute women with cancer into their own homes. The idea of caring for those close to death is sometimes lost in modern medical practice. It is an ancient ideal, expressed by Hippocrates, the great Greek philosopher and founder of medicine, who gave us the oath that all physicians pledge to uphold. It was also Hippocrates who said that, “while the young fear death, the old fear dying.” It is the indignity of the dying process that most frightens our patients. At Calvary, we are dedicated to easing that fear for the patient and their families. Most patients who come to Calvary know they are dying. It is my job to support them as they face the end of their days, to ease the terrible suffering in their bodies and minds, and to cushion the blow of tragedy on the shoulders of their loved ones. We immerse them in a “sea of love.” Physical pain is not difficult to manage or relieve. It is the other pain – emotional, spiritual and psychological – that cannot be treated with a pill. The opportunity to be with our patients, hold their hands, and ease their pain as they take life’s final journey is an honor I wouldn’t trade for any accolade the “mainstream” medical world has to offer. Any doctor can diagnose medical symptoms, but at Calvary, we can also diagnose a broken heart. That’s the number one reason why I am still here at Calvary after 43 years. When I first saw the way the doctors, nurses and supporting professionals of Calvary fought that sense of abandonment with every breath, I knew I had to be a part of this miraculous beacon of humanity – this vestibule of heaven. I knew absolutely, from the very first morning I spent here, that this place was dedicated to celebrating life – every moment, for every person, no matter how sick or how little time remains. I knew that we would never abandon a patient – never! It was the sacred importance of this mission that so intoxicated me on my first visit that every day since then, I have rushed to work, looking forward to all the joys and tears of this glorious place of life. If Calvary were to somehow cease to exist, the loss would be felt from here to Heaven. I know that my heart would be broken forever. I would lose that “burden” that became my greatest surprise and the greatest gift of my life. People who are facing death come alive at Calvary. And I believe that is nothing less than a miracle. Such a miracle happened to a 32-year old mother about to die of uterine cancer. Hour after hour, she’d lie motionless with her face turned to the wall. Finally, one of our Pastoral Care staff members was able to coax this deeply depressed, deeply religious woman to express her greatest fear. So we did something about it. After contacting the woman’s parish and learning that her daughter still had six weeks of catechism left, we convinced her priest to put her on a crash course to finish in half the time. When the mother heard the news, this woman, who had virtually stopped living, came back to life. Her daughter’s first Holy Communion was celebrated right here in Calvary’s Interfaith Chapel – with her family, with members of her parish, and our Calvary staff too. Because the mother was poor, a friend paid for her little girl’s white Communion dress. And her Calvary physician, Dr. James Cimino, chipped in with a huge cake for the reception and a beautifully wrapped present topped with balloons. At the end of the ceremony, when the little girl gave her mother a rose, there wasn’t a dry eye in the house. And when she died a few weeks later, she died in peace. Throughout her life, Elisa has always been a strong woman. Independent and headstrong, her husband once said if she had been a man she would have been a multi-millionaire. Unfortunately, Elisa’s life had been plagued by cancer. She had a brain tumor 30 years ago. She also had breast cancer and cancer of the adenoids. Three times, she fought back against cancer and won. But when cancer reappeared, Elisa’s doctors finally had to admit that they had run out of options to cure her. Although Elisa had struggled her entire life with cancer, she was determined to stay at home. But she didn’t know how she or her family would manage the special care she would need. As Elisa’s condition worsened, her medical needs increased and her family felt increasingly overwhelmed. After all, they were not trained medical professionals. Elisa’s daughters cared for her as best they could, but they all had jobs and families of their own. Calvary@Home was able to come to her rescue. Our hospice doctors and nurses are experts at providing wound care and pain management in the home. We also provide the medical equipment and supplies such as oxygen machines, walkers, wheelchairs, and special beds that patients need to continue to live as fully as possible. But what Elisa’s daughters will remember most about Calvary Hospice happened on one special day in the summer. True to her nature, Elisa was still fighting and still alive six months after doctors gave her just weeks to live. And true to her nature, she wanted to live every minute of her life. Elisa said she wanted to go to the top of the Empire State Building and she wanted to ride the carousel in Central Park one more time. She hadn?t been on a carousel since she was a little girl. And like so many lifelong New Yorkers, she had never been to the Empire State Building. When her daughters told us about Elisa’s dream, we knew we had to make it happen. So on a warm day in June, we arranged for Elisa and her daughters to visit the Empire State Building. Glaucoma and cancer had blinded her, but Elisa could feel the wind and the height. As she sat 1,000 feet above her beloved New York City, she could see it in her heart. And when she rode the carousel in Central Park, she returned, for a few moments at least, to the happier days of her childhood.